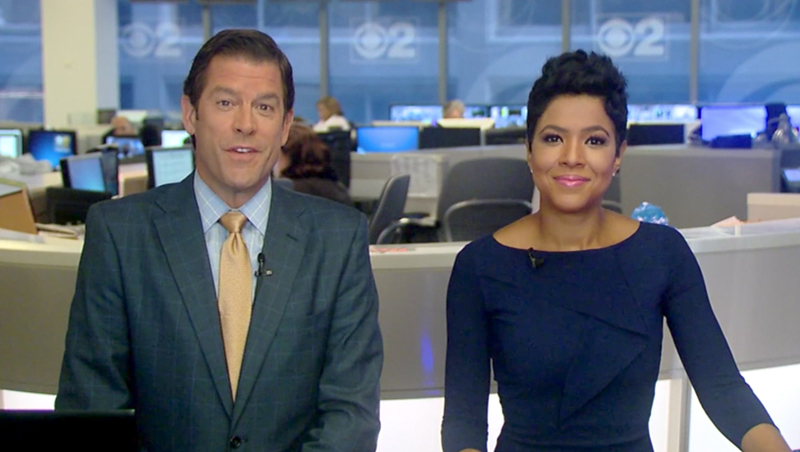 CBS Chicago has moved its newscast to a temporary setup in the station’s newsroom as it prepares for a new set. The station will no longer use its streetside studio at the corner of Washington and Dearborn streets and has reportedly leased the space to a retail outlet, according to sources at the station. In the meantime, the station is anchoring its newscasts from a position in the newsroom on one of the upper levels of its building. Viewers are treated to a view of an internally lit half wall and a span of branded printed graphics. With WBBM abandoning the streetside concept, only ABC O&O WLS will remain using a streetside studio in Chicago, a trend that once swept through all of the “big three” affiliates in the market. WMAQ, the NBC O&O, previously used a streetside studio a few blocks from NBC Tower for its morning and midday newscasts but closed it in 2013. Fox O&O WFLD has a second-floor windowed studio overlooking Michigan Avenue used for select segments during its “Good Day” program. It’s worth noting that, in recent years, WBBM’s streetside studio was utilized as if it had no windows — with the windows rarely making an appearance on air, similar to WLS. WBBM’s offices and studios are part of Block Thirty Seven, a mixed used development named after the block’s original designation in the Chicago city plans.